For a Limited Time receive a 16 oz. 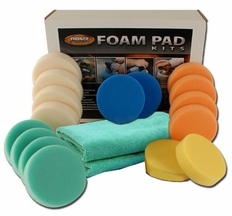 Wolfgang Pad Werks Pad Cleaner & Extender FREE with your purchase of this kit! Retail Value $15.99. For swirl-free paint, start here! Restore the shine to your vehicle with the Cyclo PRO Wolfgang Kit. 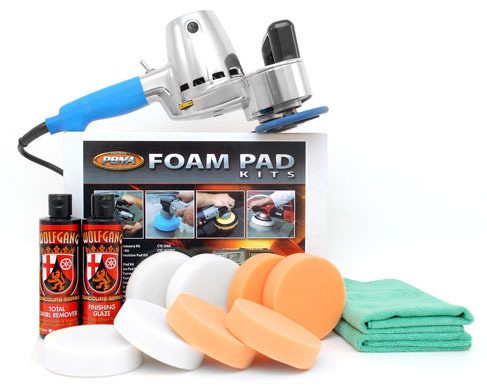 The Cyclo 5-Pro is the first variable speed Cyclo polisher. When used with Wolfgang polishes, the Cyclo polishes out imperfections and creates a smooth, brilliant finish. The Cyclo's variable speeds provide more options to tackle different paint conditions. Wolfgang's Total Swirl Remover and Finishing Glaze are a 1-2 punch to swirls. Use the Cyclo PRO Wolfgang Kit on all types of paint. This is just the beginning! Once you use the Cyclo PRO Wolfgang Kit, you'll see how easy it is to get great results with the Cyclo 5-Pro. The machine can also be used for wax and sealant application and pre-wax cleaners. All 4 inch pads with hook and loop fasteners will work with the Cyclo. A total retail value of $454.95. Save $54.96!